Chris Roberson's short fiction has appeared in the anthologies Live Without A Net (Roc, 2003), The Many Faces of Van Helsing (Ace, 2004), Black October, Electric Velocipede, and Asimov's, with new stories forthcoming in Asimov's, Postscripts, and FutureShocks (Roc, 2006). His first major release novel is Here, There & Everywhere (Pyr, 2005), and forthcoming titles include The Voyage of Night Shining White (PS Publishing, 2006) and Paragaea: A Planetary Romance (Pyr, 2006). Roberson has been a finalist for the World Fantasy Award for Best Short Story, the John W. Campbell Award for Best New Writer, and twice for the Sidewise Award for Best Short-Form Alternate History (winning in 2004 for the story "O One"). He was a co-founder of the Texas-based writers' collective Clockwork Storybook. In addition to producing monthly material for the collective's online magazine, Roberson produced four novels under the aegis of their imprint -- Voices of Thunder, Cybermancy Incorporated, Set the Seas on Fire, and Any Time At All -- which received positive reviews from The Magazine of Fantasy & Science Fiction, Asimov's Science Fiction, The New York Review of Science Fiction, infinity plus and RevolutionSF. In 2003 Roberson and his business partner and spouse Allison Baker launched the independent press MonkeyBrain Books, an publishing house specializing in genre fiction and nonfiction genre studies. Releases include the extraordinary talents of Michael Moorcock, Alan Moore, China Miéville, Jeff VanderMeer, Paul Di Filippo, Jess Nevins, Matthew Rossi, Rick Klaw, and more. The upstart company has already garnered strong commercial and critical success, including a nomination for the prestigious International Horror Guild Award. Visit him online at www.chrisroberson.net. Roxanne, the precocious only child of widower Professor Bonaventure, receives a mysterious silver bracelet, the Sofia, that allows her to travel to different times and alternate worlds. In the course of her journeys to the Middle Ages, Elizabethan England, ancient Egypt, and future Oxford, she searches for answers to the questions that have always plagued her life-how can she keep her dying father alive? Will she ever find someone to spend her life with? What is the origin of the Sofia, and why was she chosen to wear it for life? Roberson's deceptively lighthearted take on the phenomena of time travel and alternate universes features a likable heroine whose quick mind and caring heart should appeal to adult and YA fans of sf adventure with a conscience. For most libraries. If Roberson tends to tell in his first novel rather than show as he does in his short fiction (his stories have been finalists for World Fantasy and Sidewise awards), this episodic romp through the Myriad, where literally every version of events plays out, offers many felicities, not least a spunky heroine. As a schoolgirl, wisecracking Roxanne Bonaventure stumbles across a wounded old woman, who gives her a bracelet. After the woman disappears, Roxanne accidentally discovers that the bracelet, the Sofia, permits travel to any point in the multiverse. Roxanne slowly learns to use the Sofia, and later, with the help of her scientist father, to control it. Her travels then begin in earnest. But several questions dog her: Was the old woman a future version of herself? Where did the Sofia come from? And why are there so few other venues that permit cross -- time stream travel in the Myriad? Just when Roxanne believes her life is over, she finds herself in the far future, with one more adventure before her -- one that may answer all her questions. Clever popular culture references, amusing showdowns and true human feeling lift this well-crafted debut. 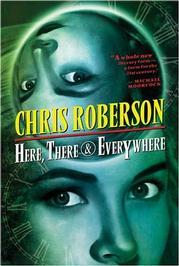 Chris Roberson's novels Here, There and Everywhere (April 2005) and Paragaea (May 2006) are published by Pyr; his anthology series Adventure (vol 1, November 2005) is published by Monkeybrain Books. ...Here, There and Everywhere (hardback) from Amazon.com or Amazon.co.uk. ...Here, There and Everywhere (trade paperback) from Amazon.com or Amazon.co.uk. ...Paragaea (hardback) from Amazon.com or Amazon.co.uk. 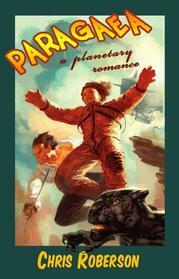 ...Paragaea (trade paperback) from Amazon.com or Amazon.co.uk. ...Adventure (vol 1) (trade paperback) from Amazon.com or Amazon.co.uk. fiction - Her Majesty, an extract from Here, There and Everywhere; Red Hands, Black Hands, a short story. non-fiction - Chris Roberson interviewed by Michael Colbert; reviews of Chris Roberson's work. Chris Roberson at Amazon.com / Amazon.co.uk.